Lani’s is located on beautiful Wallis Lake in the heart of the twin seaside towns of Forster, Tuncurry on the Mid North Coast of NSW just two hours drive north of Newcastle and 3 ½ hours from Sydney. 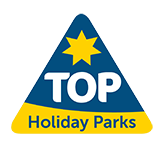 Our caravan park is a member of Top Parks of Australia, offering a range of holiday cabin accommodation to suit all budgets and tastes and for those who choose to travel with their own Caravan, Motorhome or RV a choice of sites, some with their own personal bathroom. For the tent camper who wants that natural camping experience then our additional 60 acres of natural bushland Tony’s Point Island is for you. Enjoy nights around a small camp fire, soak up the wide open spaces, delight in the beauty of a sunset and enjoy that sensational feeling of being in the bush yet so conveniently close to town. Camping on Tony’s Point Island is an experience which you will want to savour time and time again. A progressive rating scheme for the NSW Caravan and Camping Association’s holiday and tourist park members, the Awards recognise demonstrated commitment to sustainable environmental and socially responsible management. The peak National Tourism Body for the caravanning, camping, other RV products and holiday parks industry, with its responsibility to promote our key tourism market too Australian Holidaymakers. Become a G’Day Rewards member. A 2 year membership is $50 and you’ll receive a 10% discount off your site or cabin accommodation fees to a maximum of $50.00 per stay. Joining is easy, just ask one of our reception staff and we can sign you up immediately. You will walk away with your member card and start reaping it’s rewards.